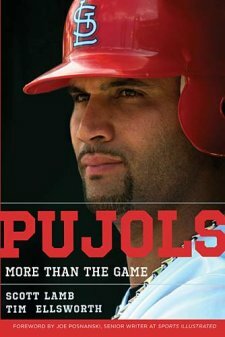 Pujols: More Than a Game by Scott Lamb and Tim Ellsworth is a thoughtful and informative account of baseball all-star, Albert Pujols. The book chronicles the journey that Pujols took from the Dominican Republic to the big leagues. The authors’ provide a detailed look at Pujols pilgrimage which is an inspiring rags to riches story. Pujols contains the typical biographical data that appeal to baseball fans. But this is more than a statistical smorgasbord. It is a rich account of Pujol’s personal faith in Jesus Christ and the difference the gospel makes. And the gospel has truly impacted Pujol’s life. The glory of God is clearly revealed in his life through the Pujols Family Foundation (PFF), through his marriage, and by his attitude and actions on the field. Lamb and Ellsworth carefully assure readers that Pujols’ statistics are legitimate. In other words, the record books need not place a “check mark” next to 408 career home runs or 1230 career rbi’s. This baseball player is clean and the authors do a terrific job in arguing Pujol’s base. Pujols serves as an inspiration to young people who are looking for heroes to emulate. The book demonstrates the value of hard work, integrity, and persistence. But most importantly, Pujols shows the importance of doing all things for the glory of God (1 Cor. 10:31). Thanks for writing this review. I’m looking forward to reading it! I just finished Josh Hamilton’s “Beyond Belief” a few days ago and think it’s interesting that the two best hitters in baseball are followers of Christ – Wouldn’t it be great if the two best politicians, musicians, painters, teachers, etc. were followers of Christ! Maybe these guys will start a trend!